Different command lines always come up with the same error. O/S is Win7, nothing else extraordinary going on. Many thanks for any useful tips! This gets incredibly frustrating. Apparently "avrdude: stk500_getsync<>: not in sync: resp=0x00" is all the response I will get from avrdude with ANY device, EVER. I am trying at this point to get either of two USBASPs and an Arduino Uno and all combinations thereof to at least show a sig. and get the above error. This used to work! Going from usbasp #2 to usbasp #1 I get the same error. Seriously, what's going on here? O/S is Windows 7. Nothing obviously strange anywhere. Many thanks for any answers! Does the target (Arduino Uno) have power on it? Go on. 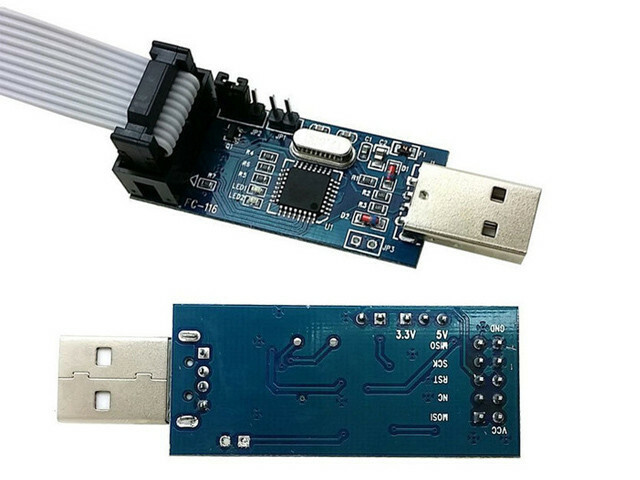 USBASP is a USB device. You do not give it baudrate or COM arguments. Post a link to the actual USBASP that you have bought. A proper $3 Chinese dongle should work fine. Quote the actual commandline. You will get proper advice. OK, no COM arguments. The baudrate was in the line for the Uno > usbasp. Either of these usbasp devices show up in Device Manager as working properly when plugged in. Quote the actual command line. The odd thing is that this worked previously. You will get proper advice. . David. Where did you get the command line using "-c stk500v1"? Edit: Ignore the lines below this line - I can't get rid of them. My apologies. Thanks for the photos. Especially that you have numbered #1 and #2 board. Both USBASP boards should work fine. They both have 5x2 headers. The Uno has a 3x2 ICSP header. Your third photo shows what might be a 5x2 to 3x2 Adapter. I strongly advise that you use a 3x2 Adapter and 6-way ribbon to plug into the Uno ICSP header. You can also try connecting to your USBASP#1. Connect both with the 10-way ribbon. put jumper on #1 JP2. put jumper in 5V position JP1. You can repeat the second operation with USBASP#2 as target if you solder 2x1 male header in the JP2 holes. If I am wrong about the 3x2 Adapter, I strongly suggest that you buy or make one for yourself. And use proper 6-way ribbon instead of jumper cables. If you do use jumper cables, write down which colour jumper joins which header pins. And show clear photos that enable other eyes to check your words. Yes, you can use a Uno as ArduinoISP but it is less convenient than a USBASP with proper matching ribbon cables. Once you have verified that both USBASP boards work, you can try reading more than just the Signature. You may remember that these had different JP2s, but initial tests seem to indicate that these are all OK.
What I really need at this point, though, is a command line program that can cut & paste, unlike awful old Windows CMD, which is just beyond praying for. Any suggestions on this? I can't post results otherwise. From a thread on a wildly defective usbasp #1, which we apparently corrected. Yes, your #1 has the wrong legends. #2 is correct. In practice, I always use the bootloader with Arduino. With AS7, I created External Tool entries for Bootloader(s) and USBASP targets. I do not have to type the full avrdude command. Likewise, I have a BAT command if I want to use directly from the commandline. Make sure that this setting is stored as the default for every "Command Prompt" you open. Ah-ha. I did not know that this was possible !! My PC has given me PowerShell ever since I foolishly let it go from Win7 to Win10. Powershell allows you to copy-paste in the conventional manner. But everything else is pretty horrible. All I need now is to find out how to get back to cmd.exe. ...except the LED going out.
? 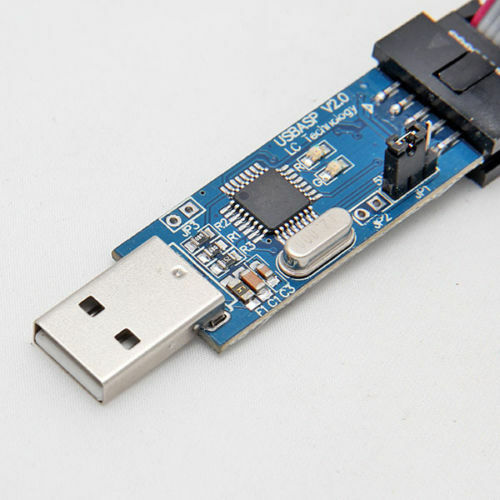 Surely it should be "-p m328p" if the chip you are connecting to is actually an atmega328p ? It certainly is strange! There's nothing connected to it. It was just a self-test. Well clearly that previous dialog did contact a chip and that chip did report that it was a 328p. What do the markings on the chip say? I give up. I gave you some pretty clear instructions. e.g. JP1 3x1 set to 5V. JP2 2x1 either open or closed. Regular programming is with JP1 set to 5V. JP2 open. Connect 6-way ribbon to Uno. Both USBASP #1, #2 should read Uno signature. Reading USBASP's signature requires one USBASP as regular JP2 open and target USBASP with JP2 closed. I don't want to see a whole load of verbose output. I just want to see a CLEAR description of your wiring (or a photo). And what command with what reply. It looks as if #1 reads the Uno just fine. Now read the Uno with #2. That was easy. Both your USBASPs are working fine. There is no need to change any firmware unless you want to program some obsolete AT89 parts. You never need to close the 2x1 header. I often use the 3V or 5V setting when powering external boards. Or use the NC setting when the target is already powered. Good, thanks. I knew it was probably something simple. I'll let you lie awake nights wondering how avrdude magically saw that 8 chip as a 328p.